This famous Roman Catholic church was built between 1880 and 1884. It is the church of the London community of an international Catholic Congregation of priests called "The Oratory of Saint Philip Neri' or Oratorians. St.Philip Neri (1515-1595) founded his Congregation in Rome and it then spread throughout the world, now numbering some eighty houses, and some six hundred priests. Soon after converting to Catholicism in 1845, Father John Henry Newman (now Blessed John Henry) became an Oratorian and brought Saint Philip's Oratory to England from Rome. The first English foundation was in Birmingham, then a further group of converts led by Father Wilfrid Faber founded the London Oratory. The adjacent house was built first, with a temporary church on the present site. The present neo-baroque building was consecrated on the 16th April 1884. The architectural style and the atmosphere of the church were deliberately Italianate, in order to bring Saint Philip's romanità to nineteenth century London. The present church was restored and redecorated to celebrate its centenary in 1984. An Oratory is a house of prayer. St.Philip attached great importance to divine worship being celebrated with reverence and beauty, and the power of sacred music to raise our hearts and minds to God. The Fathers of the London Oratory have always tried to maintain this tradition, and still do so today. Saint Philip Neri was particularly devoted to Our Lady. He used to say "My sons, be devoted to the Madonna". This is why the founding Fathers of the London Oratory wanted their new church to be dedicated to the Immaculate Heart of Mary. Saint Philip was also a devoted servant of the Popes of his time, and his sons today maintain his spirit in this way also, by their loyalty to His Holiness the Pope, the Vicar of Jesus Christ and visible head on earth of the Catholic Church, which Blessed John Henry Newman described as "the one true Fold of the Redeemer". 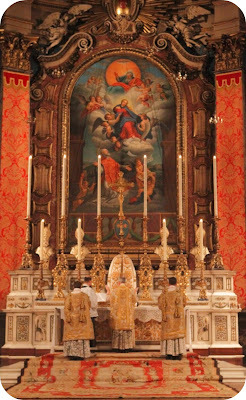 The London Oratory Charity is registered with The Charity Commission for England and Wales registered number 240702, with the aim of advancing the religious and other charitable work being carried on under the direction of the Congregation in such ways as the trustees, with the approval of the Community, think fit. Our current fundraising priorities are the dome roof, St.Mary Magdalen's Chapel, St. Patrick's Chapel, and the Sacred Heart Chapel.